What's this starchy potato-like root thing? We're here to tell you. Perhaps the most common in the US, the potato is native to the Americas and comes in a variety of sizes, shapes, textures, and colors. Potatoes should not be eaten raw, but can be cooked in … you know what, we don’t need to do this. You all know what a potato is. The sweet potato is a much more interesting plant than it’s given credit for. 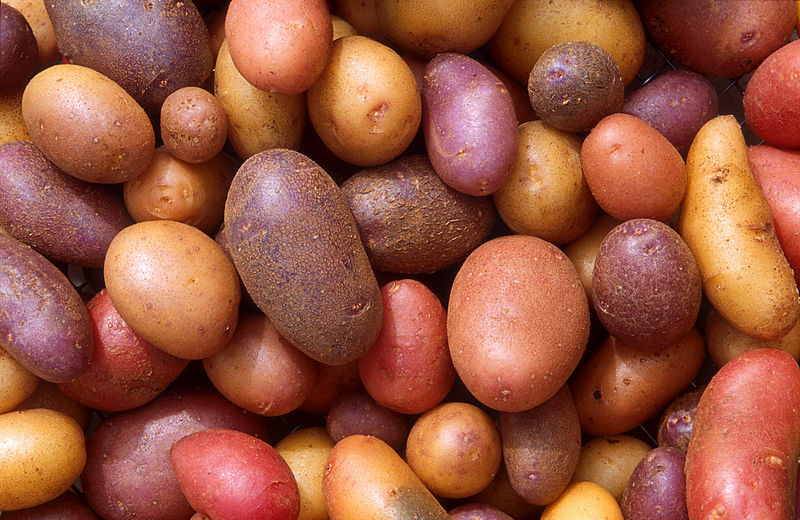 It’s not closely related to the potato, despite the similar name, area of origin, and general appearance; it comes from an entirely different family. Unlike the potato, the entire sweet potato plant is edible, from the leaves and flowers to the vines. It comes in a bunch of different colors – orange is the most common here in the US, but white, yellow, and deep red are also available. With much higher sugar and sodium content than the potato, sweet potatoes are used in both sweet and savory dishes all around the world. Ah ha, wait a second. Did you think yams and sweet potatoes were related, or different names for the same plant? Nope: They’re totally different. 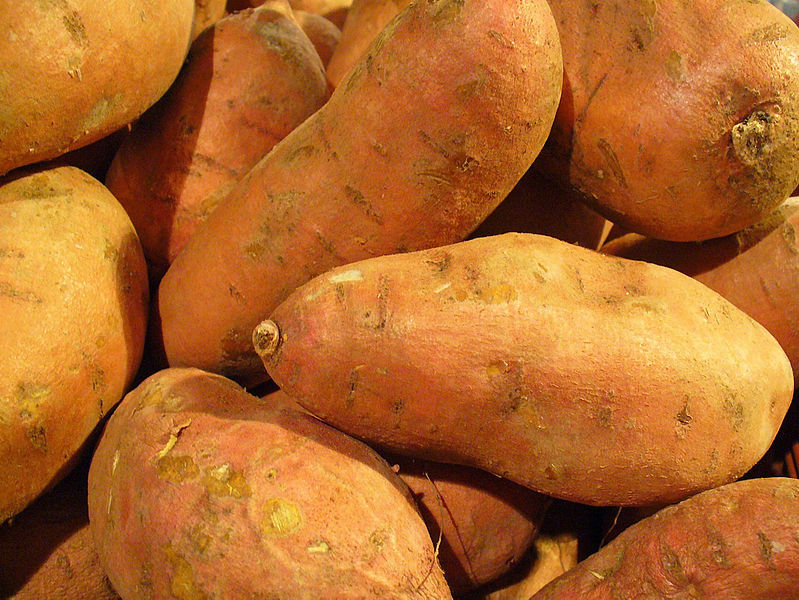 Yams are native to Africa, while sweet potatoes are native to the Americas. The two got all mixed up probably because of the slave trade: African slaves, upon seeing the American sweet potato, called it by the name of a plant they were used to (the yam). And Americans for centuries after have been confusing the two. Yams are not all that common in the US; most things labeled “yam” – canned yams, yams with marshmallows – are the orange-fleshed sweet potato. (However, the USDA does require that products sold as canned yams must indicate on the label that they’re actually sweet potatoes.) A true yam looks very different: They’re often white-fleshed with dark, bark-like skin, and they also grow much, much bigger than sweet potatoes. 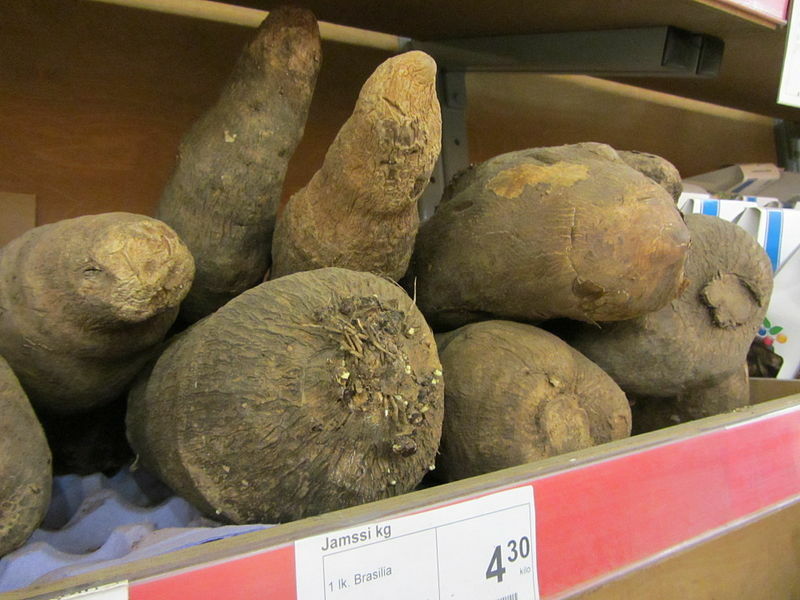 Your best bet for finding a true yam in the US is at an ethnic market: West African, Asian, or Caribbean. In Japan, the mountain yam (nagaimo), a variety with knobby beige skin, with white flesh, is typically grated into a mucilaginous goop and used as a binding agent. In the Philippines, purple yam is used in all manner of desserts, from shaved ice dishes to cakes. In Africa, it’s cooked much like a potato: boiled, fried, or baked and used as an essential starch. Hoo boy, another mess of names for this one. 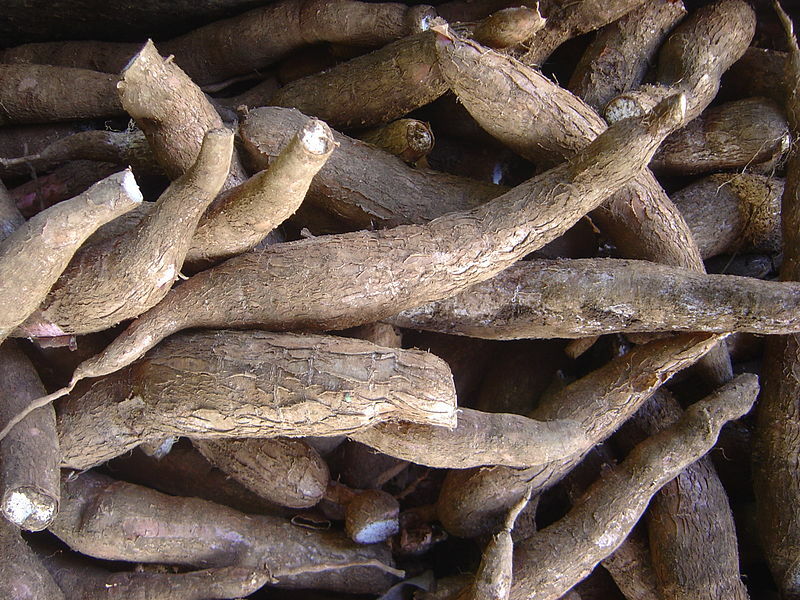 The cassava is a long, tapered, often shiny brown-skinned root that’s usually white on the inside. It’s native to the Americas yet again; possibly in Brazil, though it’s been exported to basically the entire equatorial world and is an essential starch all over the world. Its names can be confusing. 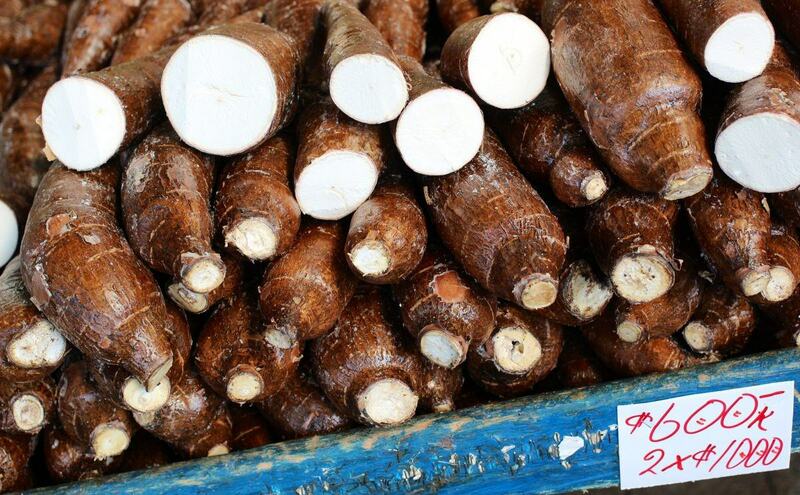 It is correctly known as the cassava, manioc, or yuca, but is often referred to as yucca. This is not really correct; the Spanish word for the plant is yuca (note the spelling, though the pronunciation is the same), due, probably, to some early linguistic confusion between the cassava (yuca) plant and the true yucca, an ornamental cactus-looking plant common in the Southwest. 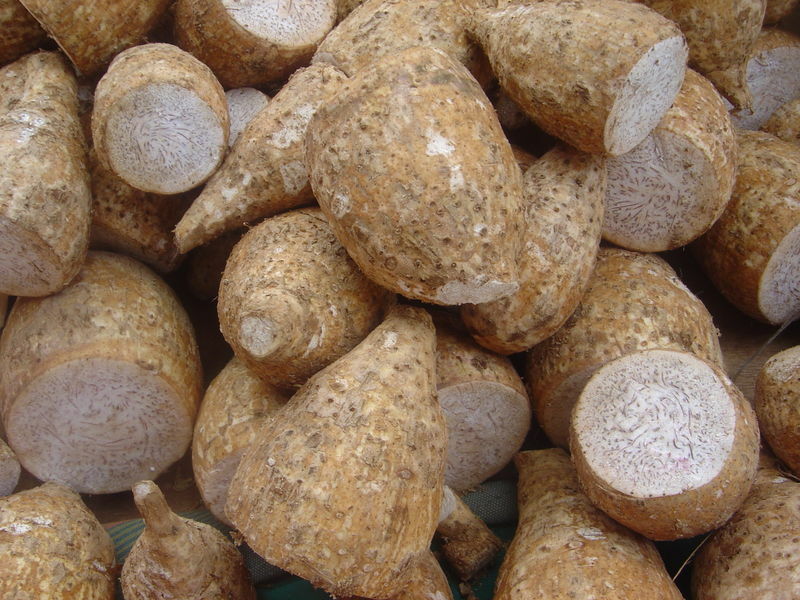 Another bit of confusion: When processed, the root of the cassava is known as tapioca. In the US, tapioca is most associated with a pudding filled with little gooey balls; those balls are, traditionally, made of dried and powdered cassava. But the tapioca powder is used for all sorts of other stuff, including flatbreads, desserts, and snacks. Cassava is most often seen in West Africa, where, after it was introduced by Portuguese traders, a mash of boiled cassava became the primary calorie source for many countries. It’s known as fufu, and it takes the place of rice, corn, or wheat. Taro is not technically a root nor a tuber; the part most commonly eaten is botanically a corm, meaning a thickened underground stem that’s used by the plant to store nutrients. The plant itself is most recognizable by its absurdly large leaves, sometimes known as elephant ear leaves. It’s most popular in the Pacific, ranging from China in the west through to the islands with which it might be most associated, Hawaii. 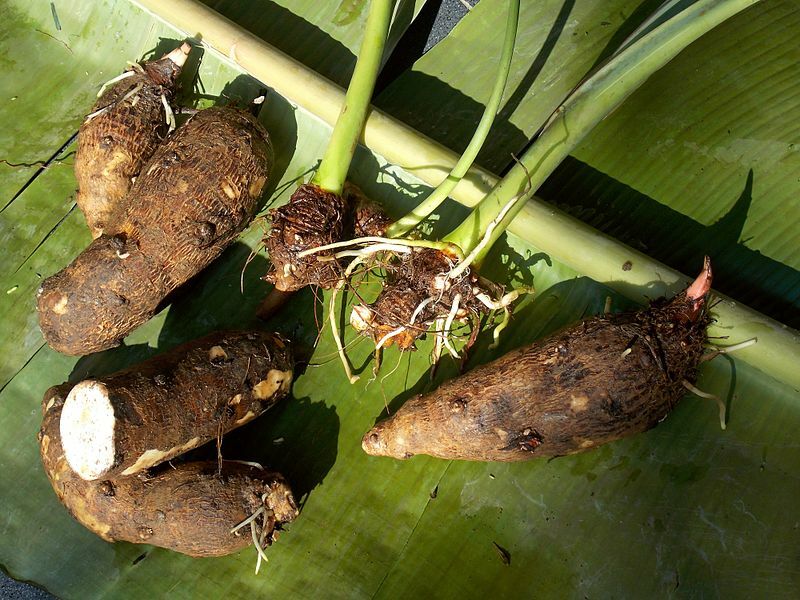 The corms of the taro are fairly high in carbohydrates, with a mild nutty flavor. It’s eaten, typically, much like a potato, either boiled, baked, or fried, and is very commonly sliced thinly and fried like potato chips. It’s used in many different ways in Hawaii, but it’s perhaps most known as the base of poi, a starchy, thick concoction made of boiled taro, fairly similar to fufu. A variation is known as eddo or eddoe, and is common to the cuisines of the Caribbean. 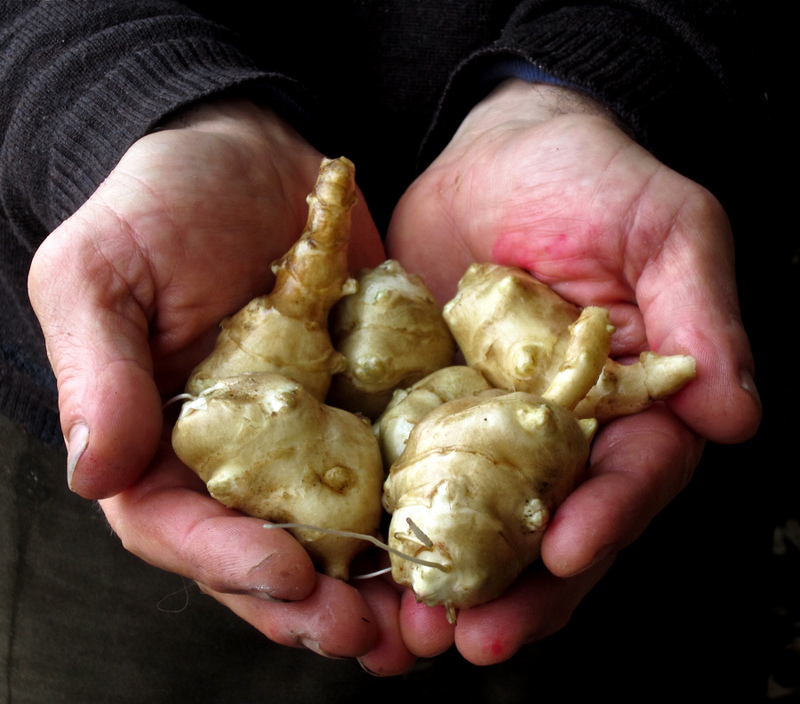 The sunchoke is sometimes known as the Jerusalem artichoke, which is wrong for two main reasons: It’s not from Jerusalem (it’s native to North America), and it’s totally unrelated to the artichoke. In fact, it’s the root of a member of the sunflower family. Naming aside, the sunchoke is an unusual and delicious root. The sunchoke looks like a knobbly, brown-and-tan knuckle, something like a cross between a walnut and a potato. But it’s unusual for a tuber in that it can (and should!) be eaten raw, with a crisp texture and sweet flavor something like a water chestnut or jicama. When it’s cooked, it’s usually boiled or roasted, and can be treated basically like a potato. 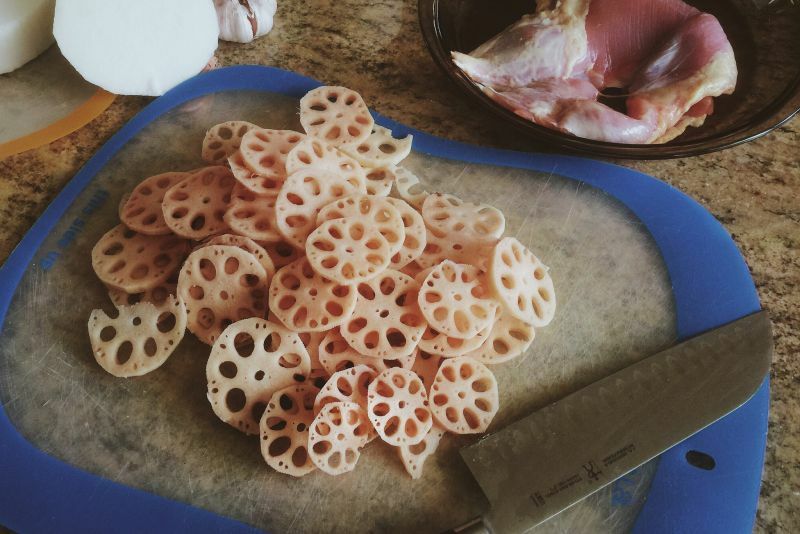 Instantly recognizable by its hole-filled structure, lotus root – like ginger – is actually a rhizome rather than a root or a tuber. It’s an aquatic plant, like a water lily, and the edible rhizome is usually sliced in rounds to preserve its pretty design. It’s kind of starchy and has a mild taste, but is common throughout Asia (both East and South) when boiled or steamed, and sometimes roasted, pickled, candied, or fried. Sometimes also known as malanga or tannia, yautÁ­a is a hairy brown-skinned root that’s kind of rounded on top and elongates into a blunted point, like a cross between a beet and a carrot. On the inside, it’s most commonly white or a light yellow. It’s very popular in the Caribbean, especially Trinidad, Cuba, Puerto Rico, and the Dominican Republic, which means that areas of the US with heavy influences from those islands (like Miami and New York City) are also laden with the roots. They’re sometimes boiled like potatoes, but in Puerto Rico are often used to make alcapurrias, a sort of football-shaped fritter made of fried yautÁ­a surrounding an interior of, usually, spiced ground beef. The leaves are also commonly used in callaloo, a dish of stewed greens.